Your vision is our priority: Offering the highest quality lenses, frames, and contacts. At Complete Eye Care we specialize in hard to fit contact lenses for dry eyes sufferers, Keratoconus, Astigmatism and more. We stock a wide variety of dailies, monthlies and long term wear contacts from all the big brands. Who Said Sunglasses Can't Be Fun? We all know about the importance of protecting our eyes from damaging UV rays, but we tend to forget just how fun getting a new pair of shades is! Visit our optical for the latest styles in designer sunglasses. 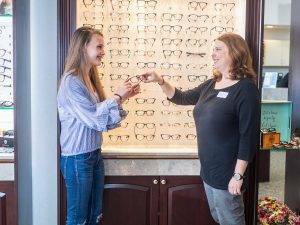 15 Million opt for new Zeiss eyeglass lenses each year. See if they are right for you. The moment you see something you couldn't before. This is the moment we work for. Using computers and digital devices increases the risk of contact lens discomfort and eye strain. Now for the first time, you can relax your eyes after a long day wearing contacts and still enjoy perfect vision with ZEISS EnergizeMe. ZEISS Individual SV is a lens so revolutionary in design that it will give you the clearest, most expansive vision available today. Wearing any other lens will seem like a compromise because no other lens is precisely personalized for you. ZIESS Digital Lens is designed specifically for your digital lifestyle helping your eyes focus more easily when viewing digital devices such as smartphones and tablets. Your eyes weren’t designed for digital screens because the constant refocusing from the screen results in your eyes getting tired faster. Only ZEISS Digital lets your eyes move easily between your digital world and the real world.